I'm a little behind in sharing some of the exciting things I participated in back in December. One of the most interesting was a project that I am really proud to have been a part of. In the summer of 2017, I was approached by the Wellington West BIA about a project they were planning as part of the Canada 150 celebrations. 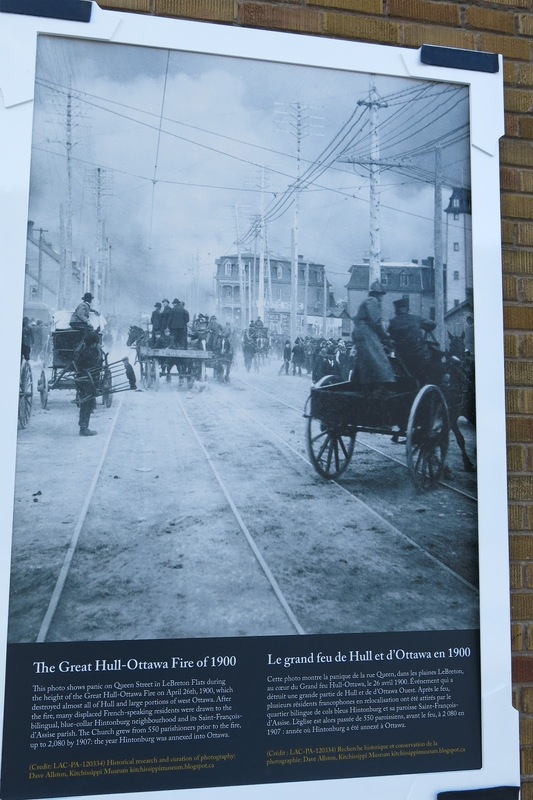 A new permanent outdoor gallery was to be installed along the wall at Wellington Street West and Pinhey Street, along the GT Express. For the opening display, the Kitchissippi Museum was asked to contribute photographs and text about the earliest days of Hintonburg, and some of the events which shaped the community as it is today. 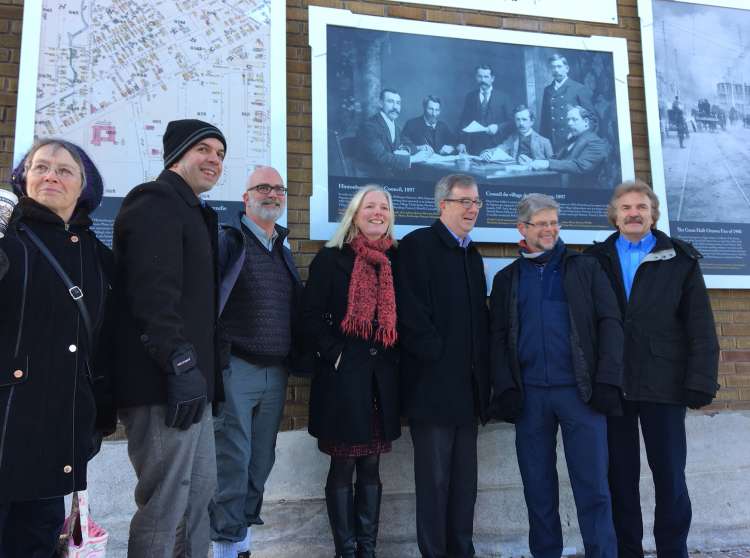 On the chilly morning of Monday November 27th, the grand unveiling was held on Wellington Street, to launch the new gallery. 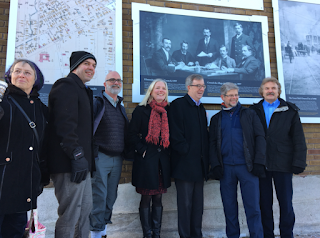 Mayor Jim Watson, MP Catherine McKenna, Councillor Jeff Leiper, and members of the BIA and Hintonburg Community Association were present for the unveiling, along with myself (and my son Emmett!). 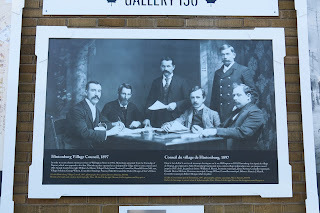 The gallery included three huge photos and detailed captions showing a fire insurance plan from 1898 detailing all of the houses in Hintonburg; a photo of the village council from 1897 (from when Hintonburg was independent from Nepean, prior to joining the City of Ottawa); and a photo of the Great Hull-Ottawa Fire of 1900, which was instrumental in the boom of Hintonburg and Mechanicsville soon after, particularly with displaced francophones from Hull and Lebreton Flats. 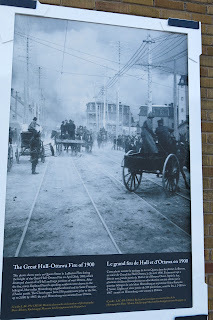 The gallery will continue to display these photos for the next 6 months or so, at which time the BIA has expressed interest in potentially doing another history display, brought up to the 1920s-1930s. The BIA has also mentioned the idea of doing another gallery at the western end of Wellington West, nearer to Island Park Drive, which would be great! Here are three photos of the gallery (but obviously, it is much more impressive to see in person!). 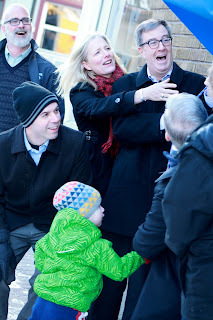 My thanks to Paul Richer for all of these photos in this post!